While historically, at BPCS, we have always held regard and respect for the Noongar (our local Indigenous people) culture and heritage, there has been a deepening awareness of the need to go beyond this. We are at a place now, where we must move beyond respect and regard, to actively engaging with and understanding Noongar culture and the heritage of the land on which we stand. By doing this, we, as a community, can play a part in honoring a culture that has existed for over 40, 000 years. It is also a way to build a sense of unity, through understanding, with Noongar people in the here and now. This is at the heart of reconciliation. As such, in 2016, we instigated a Reconciliation Action Plan (RAP) This plan of action is about facilitating a discussion in our community about reconciliation and what steps we can take towards this. What does reconciliation mean to us at BPCS? What can as a community do, to promote reconciliation? What practices and attitudes do you think we should embed that support reconciliation? What should our children understand about Noongar culture? Who else can we engage in this process? Who else can we influence in this process? On the 23rd November, 2016 – BPCS officially launched our Reconciliation Action Plan. We look forward to developing this even further as we contribute to a National attitude of respect, reconciliation and celebration. I was delighted to launch the Reconciliation Action Plan at the Grad -i-tude event last Tuesday 23rd November, 2016). In the opening to the event I also introduced to the community, Neville Collard. 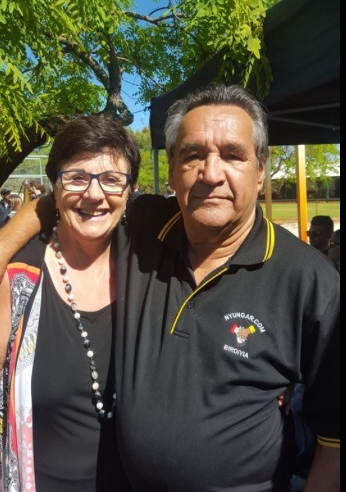 Neville is a highly regarded, and respected Elder of the Noongar Community, and has been a friend to our school over many years. I am very pleased to say that Neville has agreed to ‘adopt us’ and become the Noongar Elder of our school. On introducing Maggie Dent to Neville, Maggie described herself as the school’s “Patron Saint“, to which Neville, in his typically quick witted style replied, “...and I’m their Patron Noongar!” As they chatted, Neville & Maggie realised they grew up in the same area, and shared much in common. As many of you know this land (boodjar) our school stands on is a very significant place to the Noongar people. Our School has always held respect for that, however this year we have developed a Reconciliation Action Plan (RAP), in order to acknowledge this heritage with greater intention and visibility. I would like to thank the members of the RAP committee who have developed this plan (Paul, Lei, Audrey, Pamela & Johanna) as well as the many parents who contributed towards it. In particular I would like to mention Roni Forrest (AISWA, Future Footprints). Roni has generously provided guidance, resources and a representative Noongar perspective to our plan. The RAP centres around the following key ideas. That we must hear the stories of the past, and understand how the Noongar people lived on, cultivated and cared for this land for many thousands of years. That we must also hear the stories of past injustice and recognise the ongoing impact this has had on communities. That we celebrate and embrace the resilience of the Noongar people and their culture and build our shared future together. This is to walk the path of reconciliation; which means to bring together. On Tuesday, as Neville conducted the Welcome to Country, we heard the sounds of the language that has been spoken on this land for many thousands of years. The language of the very first people who gathered on this site, Whadjuk Noongars. As an Elder, Neville represents these ancestors. Among these was the Elder and leader Yellagonga and his wife Yingani, who walked and lived on this very site. We hope that through our collective efforts we as a school, will begin to sense their presence and the presence of all those who have come before us. As we care for this country we are all a part of, we recognise that it is the land that connects us to the past, connects us to each other and that will connect us to future generations. I have included a summary version of the RAP in this post. If there is an area of this which you feel you could contribute, or you have other suggestions, please let me know. I will leave a copy of the more detailed document in the Office which you are welcome to review.